The Environmental Protection Agency hopes to get ahead of a likely influx of public comments on its proposed Portland Harbor Superfund cleanup plan. The EPA expects to issue its proposal in April. The plans would mitigate pollution in about 10 miles of the Willamette River from Sauvie Island to just past the Fremont Bridge. Whatever is released, there is little doubt the public response will be broad, possibly overwhelming, especially when the price tag is widely known. In February, I broke the news about what EPA called its optimal plan: The agency was eyeing seven years of active in-river construction for a plan to cost around $1.4 billion. Sticker shock aside, that figure assumes that natural recovery will handle 86 percent of the work. That allows the river to bring clean sediment down, dislodging PCBs, pesticides and other carcinogens from sediment on the riverbank and bottom as the water carries them away. It's still unclear who will pay for the cleanup. Lawyers for the roughly 150 potentially responsible parties -- including NW Natural, Port of Portland and Schnitzer Steel -- are hashing that out. If all goes well, those parties will cooperate, paying for the cleanup as they're asked to. If not, and enough of those companies and agencies don't want to pay their fair share for the cleanup -- and the EPA needs to bring them to court -- it could create even more delays for the cleanup, which is about 15 years in the making. For now, the EPA will host community information sessions throughout March. 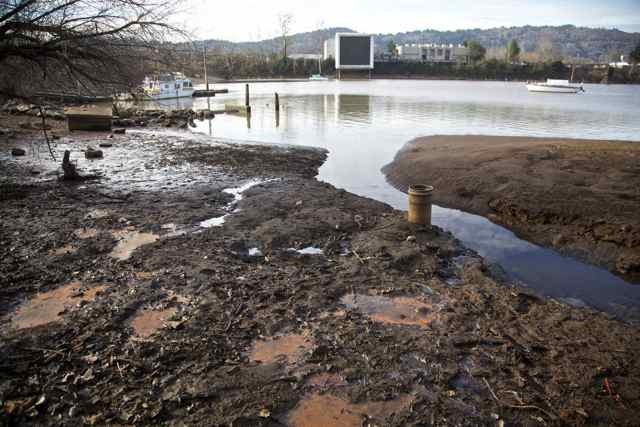 "When our proposed cleanup plan is released in April, we encourage everyone to let us know what they think," said Dennis McLerran, EPA Northwest Regional Administrator, in a statement. "We'll consider and respond to all the comments we receive before we deliver the final cleanup plan at the end of the year." A Webinar takes place March 3 at 7 p.m.
On March 17, Gray's Landing, at 0650 S.W. Lowell St. will host a meeting between 7 p.m. and 8:30 p.m. The Immigrant and Refugee Community Organization, at 10301 N.E. Glisan St., will host a gathering on March 23 between 7 p.m. and 8:30 p.m.
On March 26, the Oregon Museum of Science and Industry, at 1945 SE Water Ave. will host a meeting between noon and 1:30 p.m.